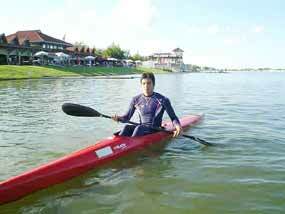 Piyaphan Phaophat, a sports science student at Chiang Mai Physical Education College, represented Thailand in the Flatwater Racing World Championships 2006 in Szeged, Hungary, August 17 - 20. Phaophat is a member of the Lanna Canoe Team based in Chiang Mai. Piyaphan Phaophat in Szeged, Hungary. In flatwater racing events, paddlers race on a straight course, each boat in a separate lane, over three different distances; 200m, 500m and 1000m. 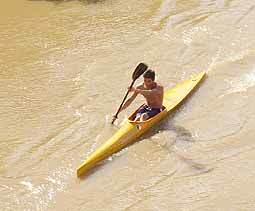 There are kayak events for men and women in single (K1), double (K2) and four boat (K4) events. For men only there are canoe events in single (C1), double (C2) and four boat (C4) events. Phaophat and team member Anusorn Sommit were on the Thai National Team and won Bronze in the K2 500 meter kayak race at the SEA Games in the Philippines in 2004. In July 2006, Phaophat won gold in the 1000m K1 and Silver in 500m K1 races. On July 10 and 11, 2006, Phaophat represented his college in the University Games. He won Gold medals in swimming the 50m freestyle, the 100m freestyle, and the 50m backstroke. He also won a silver medal in the 200m backstroke. This form of racing became an Olympic discipline in 1936 and its programme includes events over 500m and 1000m. In a kayak, the paddler is seated and uses a two-blade paddle, while in a canoe, the paddler kneels on one knee and uses a single blade paddle. Piyaphan’s dream is to compete in the next world championship, but he hopes 3 of his team members will be able to go with him. Piyaphan on the Ping River. Financial constraints are the main reason an athlete leaves national or international sport. It is incredibly time consuming for the majority of student athletes to attend both university/college and to train for and compete in sporting events. Thus, after studying and training, there is little time or opportunity to earn or save money. Phaophat, Sommit and other post-secondary student athletes are of such a high athletic caliber that they are able to represent Thailand at international sporting events such as the SEA Games, Olympic Games, and other World Championships. However, to do this, they need outside support and financial assistance. The Rowing and Canoe association of Thailand does not have the funding to support these athletes, and therefore must count on Thai businesses and individuals for sponsorship. Piyaphan Phaophat would like to thank those that made it possible for him to compete in Szeged, Hungary. The Dukes Restaurant, Mo’C Mo’L restaurant, the Monkey Club, Just Khao Soy, Mae Kok River Resort, The Track of the Tiger, The Kafe pub and restaurant, and several other individuals that helped to sponsor him. The 7th Aeronautical Mini Volleyball Tournament took place on August 7th. The tournament was to select Chiang Mai’s representatives at the national Aeronautical Mini Volleyball tournament, to be held at the end of the year in Bangkok. The first match between Pa Bong School (right) and Maejo School (left). Sixteen teams from the seven northern provinces of Chiang Mai, Chiang Rai, Lamphun, Lampang, Phayao, Tak and Mae Hong Son took part in the tournament. All the participants were under 12 years old. The sixteen teams were separated into 5 male and 11 female teams. 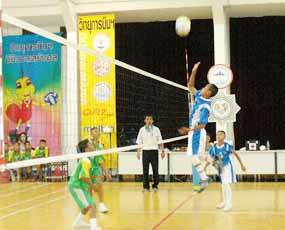 The tournament was organised by Aeronautical Radio of Thailand Co. Ltd., in cooperation with the Department of Provincial Administration, the Interior Ministry and the Volleyball Association of Thailand. HRH Princess Maha Chakri Sirindhorn sponsors the trophies awarded at national level. The male tournament finished with Maejo School as champions after defeating Pa Bong School, while Sirimangkalunsorn School came third. Huay Muang Fang Sai School won the female tournament, with Tha Luk School and Wat Buppha Ram School taking second and third places respectively. 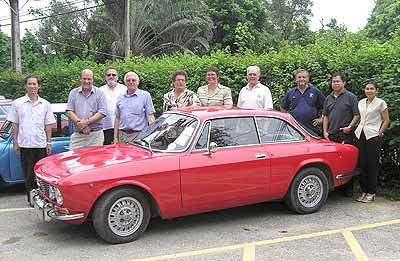 Members of the Classic Cars of Lanna group prepare for their trip on Sunday, August 27. The fast growing Classic Cars of Lanna enthusiast group leave the Gymkhana Club Aug 27 for their monthly Sunday Run. This time the trip will be around 60 km to Ban Hong south of Lamphun. Some 12 or more cars, all built over 30 years ago, will set off in convoy from the Gymkhana Club at 10 a.m. Visits to a resort for lunch and several attractive temples will contrast sharply with a call at an auto junk yard on the return trip, where several ‘saveable’ old cars have been spotted. The group’s first Evening Cruise and BBQ on August 17 was a great success. The cruise started from Rimping Superstore on the Central Ring Road and took the contrasting convoy (1938 Fiat, 1975 Porsche 911S, 1965 Mini 1000, etc) on a tour, ending at CL Garage, Old Lamphun Road. There, some 20 members enjoyed a barbecue laid out between restoration jobs on Mercedes, Alfa Romeos, VWs and Fiats. More information on Classic Cars of Lanna from membership secretaries Cleve and Phen Reinhard (Tel 07 980 5032 or e-mail: [email protected]). 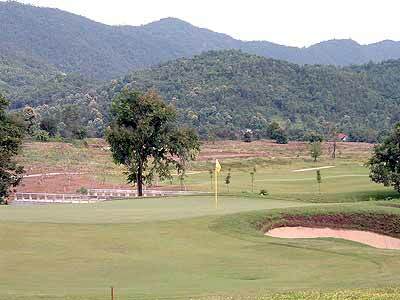 The USGA handicap system might need a computer genius to operate it, but it’s being hailed by Chiang Mai’s Royal League as a provider of fairer assessments for players of varied ability. The system not only assesses current form, but also the course being played and the boxes players tee off from. Since the League took it on just three weeks ago, it has been instrumental in creating ties for first and third places in two consecutive weeks. Grahame has every right to be pleased, as he was one of the joint winners in last week’s Stableford event, with a net 74 off an 11 handicap for 34 points. After a barren patch of almost 8 months, Grahame played with more consistency last time out, recording only two double bogeys and putting well. Nevertheless, he did manage to find the water on a few occasions - twice on one hole apparently. Grahame currently lies 4th in the Prize Winners List and last week’s co-champion, Peder Koch, moved into 19th position with a net 77 off a 17 handicap for an equal 34 Stableford points. Peder carded an erratic front nine, which relied on pars at the 2nd and 5th to lift his score at the turn to 15 points. But he settled down on the homeward stretch - went from strength to strength - and finished with a birdie on the par 3, 17th and a par on the par 5, last. Michael Goessl and Mike Neun are currently 15th and 17th, respectively, in the Prize Winners List, and last week the new handicap system may have helped them to share third place, one point behind the winners. The Kennel Association Siam organized their 2006 Dog Show at an outdoor courtyard at Kad Suan Kaew Department Store on August 13. 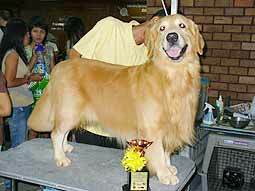 “Chogoon” received the Best Golden Retriever prize. This dog show is the fifth to be held at Kad Suan Kaew this year. There were many activities for dog lovers, including dog handling contests, a dog fashion show featuring colourful and imaginative dog clothes and a dog skills contest. The competitions were divided according to the age and breed of the dog. There were also displays and demonstrations regarding pet health and caring techniques and a free dog health check. 50 prizes were given out to the winners of each competition. Half Moon Pub was the only side of the top four teams to grab a point, in a week when all wins went the way of the visitors. Banger’s Alex back after his injury. The Moon - always in front at The Local - entered the doubles 4-2 up, which prompted The Grinders to tactically bore the pants off their opponents. They pulled one game back at a snail’s pace and then someone woke me at something like midnight to say Half Moon had won 5-4. This result puts the reigning champs two points clear of the pack, leaving them a good chance of back to back title wins, whereas The Local might be the only side ever to come first and last inside 3 seasons. Last week proved disastrous for the top challengers, with closest rivals, Friend’s Corner, losing at home in five frames. The Wall’s Jamie failed to keep The Brickies on track for a clean sweep by losing out on his singles, but the away side went further ahead after the break. With the result already decided, Friend’s roared back in the last two games to salvage a bit of pride. The shock of the night came at third placed Chiangers and Bangers, where Rock Hard Bistro ended their amazing run of one win by default and 12 losses in 13 consecutive matches. As often the case, The Rock commanded the singles - this time leading 2-0, 3-1 and 4-2. But unlike previous doubles disasters, they managed to win the one that was necessary to run out triumphant on this occasion. Blue Sky Bar was also in for a nasty surprise in their derby match with Blue Sky Garden. After losing the first game, The Garden grew in confidence and ended the first half two frames up. The Bar found no way back into the match as their opponents eased into a 6-2 lead. This result was sweet revenge for The Garden, who lost the corresponding fixture last May. Elsewhere, a resurgent December Bar maintained their 5th league spot by beating Number 1 Pub in an exciting clash that went down to the wire. 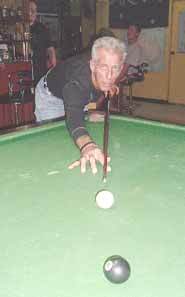 One side was unable to shake off the other and, in the deciding frame; Number 1 missed three attempts on the black before December knocked it in for the match. After the previous week’s narrow defeat to Half Moon Pub, Out Back bounced back by demolishing Enjoy Place in their own backyard. At 5-1, the match was over by halftime. Out Back claimed the first doubles before a comedy of errors saw the last two frames finish in less than 2 minutes. Out Back’s Dave potted the black out of order with his second shot in the first of them, and not to be outdone, Enjoy repeated the feat in the next and last game. At this stage last season, Happy Bar was rooted to the foot of the league, where they stayed till the end of term. But they made quite sure of no repeats with a 7-2 win last week at La Villa. The result puts Happy 5 points ahead of The Local with 4 matches left. Regarding arrangements for next season, The Local is holding a meeting for team representatives on 26th August at 2 pm. If there is time to be there, please go, otherwise more about it in next week’s Chiangmai Mail.